Check out our latest Step by Step Video, Skull helmet chin guard. In this video I show you how to airbrush this helmet chin guard, with a skull artwork using trident waterbased airbrush colours and airbrushed completely freehand. Stuart Smith, creates mind blowing unique artworks, both in monochrome colours as well as unbelievable 3D effects using UV paints. His artwork has a 'darker element' which of course we love and recommend that you should check out and subscribe to his channel. Intermediate / advanced airbrush workshop Booking NOW. 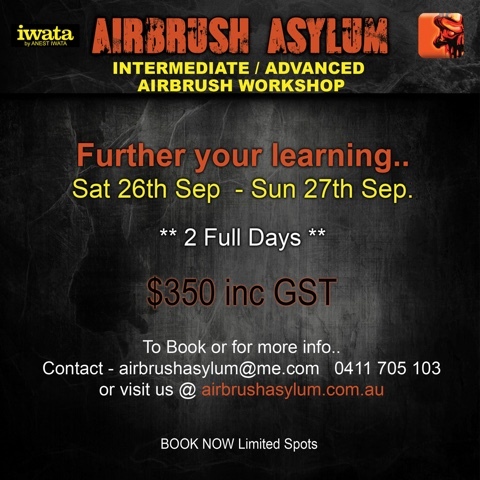 **NEW DATES** for the Intermediate / Advanced airbrush workshop. Further your learning, anyone with basic airbrush skills can join. This will be the LAST workshop for this year so now is the time to book if you are keen.